If you like this recipe, take the time to click on the link above and visit starrgirl’s page, she gets credit/money for each page view she gets, it’s not much but every little bit adds up, show your appreciation for the time she took to put this together for everyone. It has been brought to my attention that the article that I copied and pasted here, might not actually be copyrighted by the author who wrote it, when she published it to Associated Content, it became their content, and even through I gave a complete link to the site and a prompt to visit it, in order to be ethical, I will have to remove the majority of this message, I will leave the recipe (re-written to avoid any copyright issues), please visit the link to see the entire message, it’s worth reading. You will need a cutting board, a deep mixing bowl, a fork, a large serrated knife and a rolling pin. Get some newspapers or brown paper bags for drying the noodles. These measurements are approximate, with any dough, you will need to go by the feel of the dough. Break the eggs into a bowl, whip them with your fork, add the water and salt, mix well. Add 1 cup flour and stir until blended. Stir in the rest of the flour a little at a time until the dough pulls away from the sides of the bowl. You may not use all of the flour. Work the dough with your hands, in the bowl or on a floured surface, add flour as needed. The dough should be firm and elastic, not wet. When the dough is no longer sticking to your hands, it’s ready. Pinch off an egg sized piece of dough, dip it in flour, roll out the dough on a well floured surface, pick it up, flip it over and re-dust with flour when it begins to stick. Roll it out as thin as you can get it, then place it on some newspaper or brown paper bag, the paper absorbes moisture. Continue rolling out the rest of the dough placing each circle of rolled dough on a fresh piece of paper. Wait a half an hour, the flattened dough should be drying on top, flip them over on the paper to dry on the other side. Wait another 30 minutes to an hour. When the dough is dry but still soft enough to roll up, take 2 dough rounds, dust flour between the layers, roll up like a jelly roll, slice the rolls into thin strips using your serrated knife. Place the cut rings back on the paper, fluff out with your fingers to separate the noodles into a single layer, continue cutting and fluffing the remaining dough rounds. Leave them to dry for several hours or overnight. Then gather into a bowl to get ready to cook them. You can freeze them at this stage, place in a freezer safe package, use within a few months. Cook homemade egg noodles for 20-30 minutes in beef or chicken broth, add shreds of meat to the pot, serve over mashed potatoes. Nick, I sent an email to you. Thanks for the info, I saw your message on AC too! I’ll check out what you have posted soon. Tortillas from a pasta machine??!!! Shame on you…. : ) Ha ha. I’ll have to try that! I usually post non-exclusive, and opt for an up-front payment. Sometimes I get one, sometimes I don’t, but at least this way I can still publish the article somewhere else on the web, or give others permission to do so. Exclusive content becomes the sole property of AC, although your byline is still kept on the material and you can earn page view bonuses. Michael, thanks for the heads up on that, I just joined AC myself, and was starting to figure out their system, I removed that part of the message, I did leave the recipe and re-wrote the instructions, I left the link in and explained what I did. BTW, when you publish, of the 3 options: exclusive, non exclusive, display only, which do you usually choose? Ozark Mama You can pick them up new for about $20, I noticed that the one I have has gone up in price since I bought mine, I know I didn’t pay what they are asking for them now! I like the fact that it is hand operated, uses human power, don’t have to worry about how much juice it’s using. 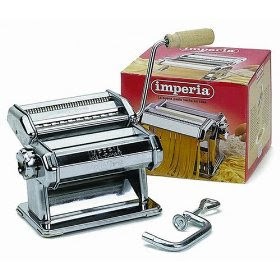 I’ve been debating the merits of a pasta machine…that one is actually on my wishlist, lol. Glad to know I can use it for tortillas!